*This section details out the setups required to perform the aging process and how the aging snapshot process is run for project transactions/invoices. This feature is not controlled by a parameter. However, the aging periods by which the AR aging list page has to be to specified on the parameters form. Using this parameter, a periodic report is generated that categorizes a company’s accounts receivable as per the length of time an invoice has been outstanding. After posting the transactions/Invoices, the aging snapshot should be run. Contract open invoice and My open invoice list page will get updated after snapshot is run. 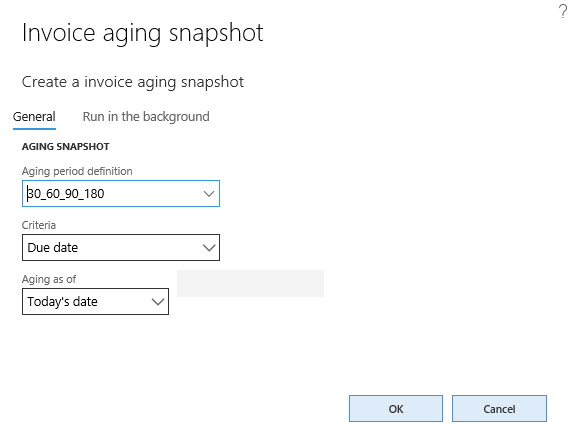 Aging period definition on the Invoice aging snapshot form will default from the Projects+ parameter. Go to Project management and accounting > Project+ Periodic > Invoice aging snapshot.